A criminal-trial juror votes to convict or acquit a defendant in the knowledge that the vote may be in error: False convictions and false acquittals are unavoidable in human fact-finding systems. 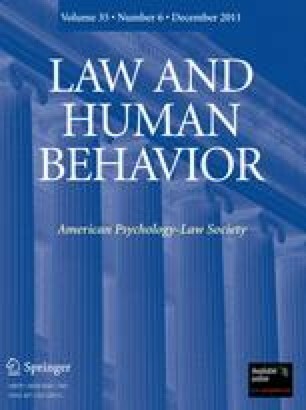 We show here that rigorous consistency relationships exist between the juror's assessments of the relative desirability of the four possible trial outcomes and his or her threshold level of “reasonable doubt.” However, numerical values for “reasonable doubt” commonly obtained by direct questioning are significantly at variance with those obtained indirectly by computation from evaluations of the four possible outcomes. The disparity is, we argue, no mere methodological detail, but a potentially fundamental substantive issue which has historically been masked by the vagueness of verbal expressions of probability and utility. Helpful comments on earlier drafts from Gary Wagner, Michael Gottfredson, Brian Thorn, Rick Greenstein, Vernon Greene, John Bartholdi, and two anonymous reviewers are gratefully acknowledged.